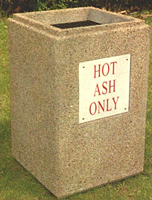 [XPB-CHAR2235] This Hot Ash Receptacle provides safety in public parks for disposal of hot coals and ashes after grilling. Welded steel bars on top of this concrete unit prevent people from putting their hands into it while hot coals may be cooling. Highly recommended for any public picnic grounds where charcoal grills are used. Available in size 24" x 35". For shipping quotes, orders or questions please call our Customer Service Center toll free at 1-877-483-9270.